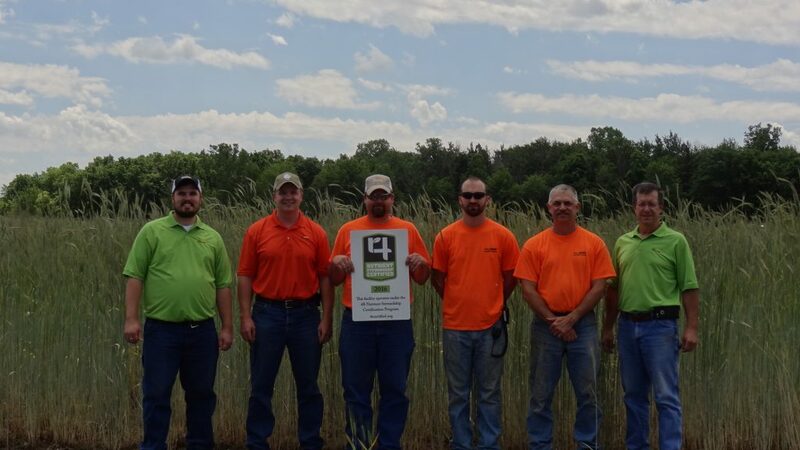 The Andersons Inc.’s Waterloo, Indiana facility is now 4R Nutrient Stewardship Certified. Employees pictured include (from L to R): Nick Jackson, Luke Rivir, Jason Hamman, Thomas Gerardot, Todd Cobbs and Greg Myers. The 4R Nutrient Stewardship Certification Program has announced that The Andersons, Inc.’s Waterloo, Indiana facility has been added to its growing list of nutrient service providers to achieve certified status. The facility is the first in Indiana to earn this status under the voluntary certification program, a concentrated effort by the agriculture industry to significantly reduce and prevent nutrient runoff, which has contributed to water quality issues in Lake Erie. The Waterloo Farm Center provides seed, fertilizer and chemicals, and also offers application services. The Andersons’ team at Waterloo consists of two Certified Crop Advisers, along with four operations crewmembers. Now in its third year, the 4R Nutrient Stewardship Certification Program certifies service providers in the Western Lake Erie Basin that apply nutrients or make recommendations in accordance with 4R Nutrient Stewardship principles – which refers to using the Right Source of Nutrients at the Right Rate and Right Time in the Right Place. Program participants must go through an annual, independent, third-party audit and demonstrate they both understand and follow 4R principles. Over 2.7 million acres and approximately 5,600 grower customers are serviced by the 34 certified facilities in Ohio, Michigan and Indiana that have earned 4R Nutrient Stewardship Certification Approximately 70 percent of those acres located in the Western Lake Erie Basin. “By participating in the 4R Nutrient Stewardship Certification Program, The Andersons’ Waterloo facility has proven its ongoing commitment to the long-term improvement of Lake Erie’s water quality,” said Carrie-Vollmer Sanders, Nutrient Stewardship Council chairwoman. The 4R Nutrient Stewardship Certification Program is governed and guided by the Nutrient Stewardship Council, a diverse set of stakeholders from business, government, university and non-governmental sectors with a common goal of maintaining agricultural productivity while also improving the quality of Lake Erie and its contributing watersheds. The program is administered by the Ohio AgriBusiness Association. MEDIA: A photo of The Andersons’ Waterloo facility employees receiving their 4R Certified sign is included with a suggested cutline above. Click photo to download.